Hire a car in Cluj Napoca and get our cheap rates for Skoda Superb Tdi! Tips for easy car rental Cluj Napoca! We partner with every major car rental company in Romania to help you find the best rental car deals & discounts. * When you choose your car rental period, you can also select a pickup and drop off location in Romania and time at your convenience: airport, specific address, midnight or early morning etc. * View specific car hire rates, according to your selection. * Select your preferred car class, car brand, gear transmission or fuel type on the rental car. * Take a look over all our available vehicles for rent or choose a vehicle car class to see what we have available and the rental costs. * Once your decision is done, and you clicked on the "rent now" button go to the next step to see the total cost, what is included in price and car hire features. Note: See our car rental conditions in Romania for Insurance policy, accessories and extra services offered especially to have a comfortable car rental experience. * Don't forget to view our cheap Special Offers and find now our rent a car Cluj Napoca discounts! * Review your order and the total amounts (sum to pay and guarantee deposit) in the reservation section. * Take a couple of minutes to read our car rental conditions and proceed with your order after agreeing with it. * Before you complete your order you have to register as a new user or log in, if you have a previous account. * Once you're logged in or registered, your order is completed and you can review your booking history or change your account information. Also you should check your email address that you registered and our messages about the rental request. * Don't hesitate to contact us for any questions or details by phone or email. Thank you for renting with EuroCars. 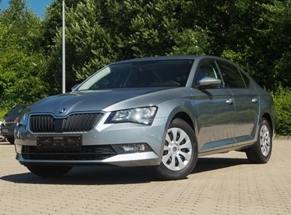 This Skoda Superb TDI is offered for rent/hire in Cluj Napoca. Covers the rental vehicle in the event of accidental damage to the rental vehicle other than by theft or attempted theft. Theft Damage Waiver provides coverage for the theft towards your rented car, provided by an official statement document obtained from the official authorities. Third Party car Insurance covers you for damage caused by your car to a car owned by a third party in the event of an accident. Value Added Tax is a tax on the estimated market value added to a product material or service at each stage of its manufacture or distribution. The value of tax in Romania is 19% applied to the price of product or service. Additional drivers will be anyone other than yourself, who will drive your rental car. Even if you rent a car, but never drive it, you are automatically considered the primary operator of the rental vehicle. Anyone else who drives your rental must be approved by the rental company. They must complete and sign a form at the rental counter. Usually the company offers you the car with a full tank of fuel. The client has to return the motor vehicle when the period of contract ends with full fuel tank (otherwise the Client shall pay the quantity of fuel at the price of 1,5 euro per liter).